Sunday night I went to the theatre to see Trouble the Water, a new film by Tia Lessin and Carl Deal. Lessin and Deal produced Bowling for Columbine, and directed and produced Fahrenheit 9/11. But Trouble the Water is different from both of these: It spends more time zoomed in on the subjects of the film–Kimberly and Scott Roberts, a young, married black couple, and their neighbors and family–and doesn’t worry as much about hitting the audience over the head with the political implications of each setback they experience. And Kimberly and Scott do experience a number of setbacks. The film begins with footage recorded by Kimberly before and directly after Hurricane Katrina hit. A lot of the shots gave me the same queasy feeling that watching The Blair Witch Project from the front row gave me a decade ago. Through the bumpiness and the blurriness, the movie gives insight into what people were feeling when Katrina landed. Kimberly interviews her neighbors before the storm hits, and later records the water rising. She turns the camera on when she and her family are trapped in the attic, and later films a neighbor setting out to rescue folks from their houses. Some reviewers felt that the rest of the movie paled in comparison to the storm at the beginning. But it was the story of putting life back together afterwards that, for me, was the most thought-provoking. After the storm, someone else takes over filming, and we see the Roberts at a Red Cross shelter, trying to track down their relief money to start over. I won’t give away what happens from there, but I will say that the ending is a little more sweet than it is bitter–but just barely. You wind up feeling pretty confident that Kimberly and Scott are going to make it, but the amount of injustice surrounding their experience is almost overwhelming. The film is an excellent piece to spark conversations on poverty, race, the media, family, the criminal justice system, government responsibility . . . the list goes on. With a running time just around an hour and a half, this is a great movie to spend an evening watching and discussing in a group. Trouble the Water‘s website also offers a great assembly of organizations rebuilding and offering relief in the Gulf. For some behind-the-scenes information, check out an August 22nd Democracy Now interview with producers Lessin and Deal, by Amy Goodman. A week ago, the Coalition of Immokalee Workers (CIW) and Whole Foods reached an agreement to work together to provide fair wages for the tomato pickers of Immokalee, Florida. The agreement was announced on September 9th, but I was en route to Columbus for the Midwest Interfaith Immigration Summit that day. So we are a week late with this bit of news, but it is truly a cause for celebrating! Because of this agreement, workers in the fields of Immokalee will receive a penny more per pound of tomatoes picked. A penny more per pound doesn’t only mark the difference between a low wage and a living wage–it marks the difference between taking advantage of workers and honoring their dignity. Congratulations, Immokalee workers and allies! Hopefully, holdouts Chipotle and Subway will get on board with the CIW soon. For more information . . . .
Scroll to the bottom of this post for links to event schedules. 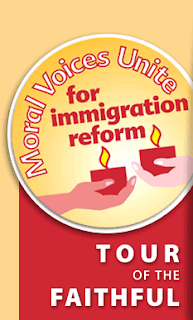 Pro-immigrant media organization America’s Voice is facilitating a national month of action called Tour of the Faithful. 17 events organized by local religious groups will take place in cities across the nation over the next month, calling for reform to the United States’ broken immigration system. The first event on the Tour was an interfaith prayer vigil held at the Ohio State House in Columbus on Wednesday, Sept. 10th. I attended together with 75 others from a diverse array of faith traditions. Rev. Mark Belletini of First Unitarian Universalist Church of Columbus offered a prayer, along with twelve other faith leaders, including Cantor Jack Chomsky of Congregation Tifereth Israel, Dr. Asma Mobin-Udin of CAIR Ohio, and Rev. Steve Hammond of the American Baptist Church. Standing under a banner that read, “Moral Voices Unite for Immigration Reform,” prayer leaders called for humane, just immigration reform and an end to raids and deportations. For me, the vigil was an extremely powerful experience. English, Spanish, and Arabic were spoken, and faith leaders often began their prayers without identifying either the God to whom they were praying or the faith they represented. Many vigil attendees also took part in a two-day Summit which taught tools and techniques for immigration reform advocacy. The Summit, which First UU Church of Columbus and the UUA Washington Office helped organize in conjunction with the Interfaith Immigration Coalition and local Midwest groups, exceeded my expectations. As the Summit drew to a close, participants shared their impressions. Many voiced a feeling that they were inspired and well-equipped to return to their communities to begin organizing and taking action. The Prayer Vigil and Summit were two of the most amazing and effective experiences I have had during my time at the Washington Office. Check out the Tour of the Faithful Schedule to see if any events are taking place near you. 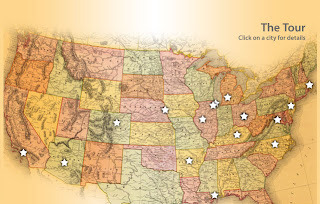 Or, see locations of all events at a glance on the event map. Every August, on what is unofficially known to policy nerds as “Poverty Day,” the U.S. Census Bureau releases its new statistics on poverty. These statistics track whether poverty rates have gone up or down over the last year, and reveal how particular demographic groups are faring. Check out this morning’s press release from the U.S. Census Bureau to see the new stats for 2007: Household Income Rises, Poverty Rate Unchanged, Number of Uninsured Down. Although, as the Press Release title indicates, overall poverty percentage rates have remained relatively unchanged, the concrete numbers of Latinos, children, seniors, & Southerners living in poverty have gone up. Although real median income for black and non-Hispanic white households rose, black households had the lowest median income in 2007 ($33,916), followed by Hispanics ($38,679). This compares to the median of $54,920 for non-Hispanic white households. Persistent Race Disparities Found, by Stephen Ohlemacher. 11-14-08. Racial Disparities, by The Urban Institute. 3-25-08. Photo Credit – Olliehigh, Creative Commons. 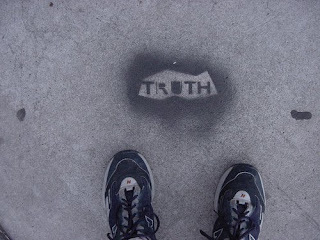 New web pages on truth & reconciliation have been added to the social justice section of UUA.org! Learn just what “truth & reconciliation” is anyway, how Unitarian Universalists have applied the process, what related legislation is out there and what actions you can take. Also, find resources on how you can explore truth & reconciliation with your family, congregation, or community. The foolish neither forgive, nor forget. 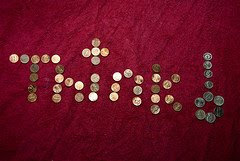 The naïve forgive and forget. The wise forgive, but do not forget. Raids and deportations are often viewed as workplace and legal issues. But there are some very good reasons that we should also view raids and deportations as mental health issues. In October of 2007, the Urban Institute and National Council of la Raza (NCLR) released a 109 page report entitled, Paying the Price: The Impact of Immigration Raids on America’s Children. According to the report, there are almost 5 million children in the United States with at least one undocumented parent–and because of our nation’s broken immigration system, any of these children’s parents could be detained or deported at any time. The psychological consequences of having a parent suddenly taken away can be devastating, especially when children are too young to understand why their mother or father is suddenly gone. There is also a risk of children “personalizing” their parent’s disappearance; a child may believe that he or she is somehow responsible, or that their parent’s sudden disappearance is connected to his or her own behavior. The resulting stress, guilt, grief, and anxiety can harm a child’s mental and emotional well-being. Schoolwork, behavior, and relationships may suffer. Paying the Price details the consequences a workplace raid had for one 8 year-old boy. For one eight-year-old boy, stress associated with his mother’s arrest manifested in health problems. Although his mother was released on the evening of the raid, he was unexpectedly picked up from school by a friend. While in the friend’s care, the boy overheard a conversation about the raid and cried for a couple of hours until his mother arrived home. Following his mother’s return, he found out about her possible deportation and experienced major separation anxiety. He was described as nervous and clingy after the raid, even though he had never displayed such symptoms before. He experienced repeated nightmares from which he sometimes awoke with uncontrollable shaking and loss of breath. He was taken to the hospital twice, and doctors diagnosed him with major anxiety disorder resulting from post-raid stress. Stories like these remind serve as a reminder of how important it is to honor family ties, even when those ties cross legal boundaries of immigration status. They also remind us of the need to continue to advocate for just and compassionate family-based immigration reform. The UUA’s Washington Office for Advocacy in Washington, D.C. and First UU Church of Columbus in Ohio have been working with the Interfaith Immigration Coalition, (an interfaith team of national faith advocacy groups based in D.C.), and Midwestern faith groups to plan the Midwest Interfaith Immigration Summit. The two-day Summit will take place Sept. 10 – 11, 2008, in Columbus, Ohio. Its goal is to bring faith-based leaders and advocates in the Midwest together to work towards educating and mobilizing their communities in support of fair and humane immigration reform. Workshops will cover a variety of topics, including state and federal legislation, Lobbying 101, Raids, Detention, and Worker Justice, and much more. I will be attending to represent the UUA, and I encourage Midwestern UUs who are interested in immigrant rights & immigration reform to attend. The UUA is offering a few scholarship to cover tuition ($95 before August 15th). If you are interested in attending and/or applying for a scholarship, or have any questions about the Summit, please contact me at lswanson@uua.org. Sponsored By: American Jewish Committee, Anti-Defamation League, Church World Service, Franciscan Action Network, Hebrew Immigrant Aid Society, Mennonite Central Committee, NETWORK, Ohio Council of Churches, Ohio Hispanic Coalition, Peace and Justice Support Network of Mennonite Church USA, Sisters of Mercy of the Americas, Sojourners, Unitarian Universalist Association of Congregations,Religious Action Center of Reform Judaism, United Methodist Church General Board of Church and Society, United Jewish Communities, & World Relief. Endorsed By: Friends Committee on National Legislation, Interfaith Worker Justice, Jewish Council for Public Affairs, and Lutheran Immigration and Refugee Service (LIRS). Made possible in part by a grant from the Open Society Institute & The Carnegie Corporation of New York. 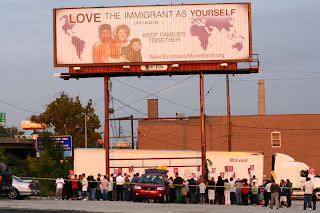 This is actually old news, but I just saw a picture of a billboard erected almost a year ago by the Immigrant Justice Advocacy Movement (formerly the New Sanctuary Movement Coalition of Greater Kansas City), and wanted to share it here. Picture credited to KMBC – TV of Kansas City. Last year, about twenty churches in the Kansas City, Missouri, decided to form a coalition in support of immigrant families as part of the New Sanctuary Movement (NSM). Among these was All Souls UU Church, members of whom were present September 25, 2007, when over a hundred people gathered to announce the coalition. I think the Immigrant Justice Advocacy Movement found the perfect words to convey that message. Click here for a Unitarian Universalist guide to the New Sanctuary Movement, or check out our webpages on Immigration at UUA.org.